Alan recently had a solo exhibition at Castor in London. His limited-edition Shatter Resistant is currently available from Castor, with a special discount for Century Club members, and he will be part of a larger group exhibition in the Club in October. Andy Wicks, Director of Castor spoke to Alan about the concept and execution behind the edition. In your practice, you explore ideas of labour, power and the everyday: How do you see this edition fitting within it? This edition came about from a wider investigation into systems of power, and in particular, the position of no-power. And so, I was focusing on the potential of small gestures; what Michel De Certeau referred to as “weapons of the weak”. I was interested in the significance of these small acts of resistance, where they come from, and how they manifest. I get a sense of nostalgia and play from the piece; did you look to your own childhood? Yes. I began to think of the first ‘act of resistance’ that I either witnessed, or took part in. I remembered the Helix Shatter Resistant ruler that was launched in the 1980’s. Myself and others saw the title ‘shatter resistant’, not as a description of the ruler’s characteristics, but as a personal challenge. So obviously, we immediately sought to shatter it. Your ‘intervention’ to the ruler looks arbitrary, but it’s not. Could you explain the process involved in its production? Yes…. Actually, it was formed from quite a long process involving a mix of both analogue and digital techniques. Part of the marketing strategy for the ruler involved a specific font that was all fractured -I think they may have invented it. So, during the process I scanned the ruler digitally, and reconstructed the phrase ‘shatter resistant’ to ‘fix’ the font. This was done by shifting the shattered fragments about until the text was whole. This in turn fractured the ruler’s edge, so the undulating edge is directly connected to the original font edge. Subsequently, the fractured ruler was actually formed around the text, such that the act of fixing the font, breaks the ruler. 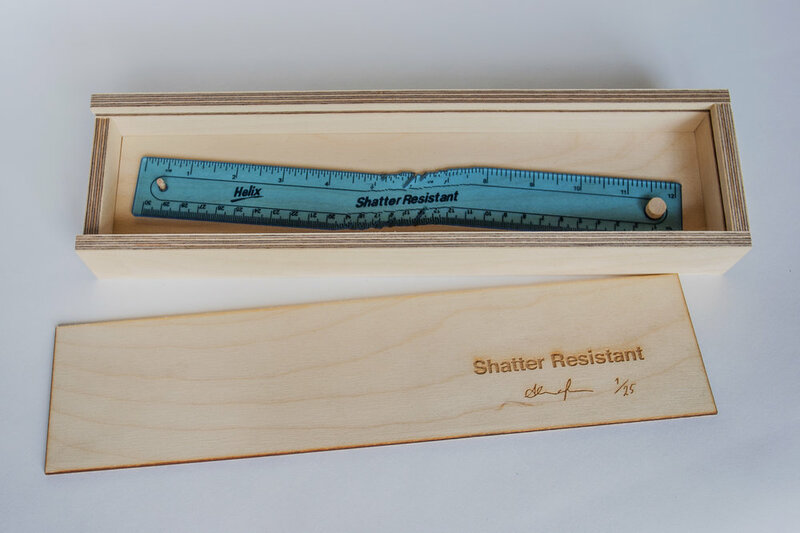 Shatter Resistant comes in a well crafted made plywood box, akin to the old home-made pencil case, that for me brings it even closer to the school context, which is very much about control and order. Do you see school as an incubator for real world power-play? Perhaps, but in schools the hierarchy is defined and transparent; even as a child you understand it. Whereas in such a globally inclined society, traditional notions of power seem naïve: Governments have less power, and big business is beyond government. But in my mind Shatter Resistant does address that; it addresses the relationship between the individual and the corporation at its most basic. Shattering the ruler wasn’t in response to the school system, it was the object that came from outside…. that's how I view it anyway. Where will we be able to see more of your work? Right now, I’m working on a large site-specific installation for Castor for Artlicks 2017 (Sunday 1st October 12 - 6 pm), then I have work in a group show in Colyer Bristow gallery, which runs till February 2018. We are pleased to be able to offer a special 10% discount on a limited edition edition by artist Alan Magee to Century Members to mark the occasion of Castor Gallery's exhibition at Century, which Alan will be included in. £225 + shipping for Century Members. For further information or to order please contact leo@centuryclub.co.uk.